Dive right in – this property is only a 4-minute walk from Lagoon Beach! 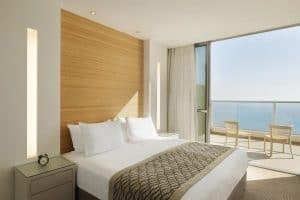 Ramada Hotel & Suites is set 1 km from the centre of Netanya on Israel’s Mediterranean coast. It offers elegant suites, an elegant spa, and a seasonal outdoor swimming pool. Free private parking is available on site.Featuring a balcony with views of the Mediterranean Sea, the spacious suites include an equipped kitchenette and living room. All rooms have a flat-screen TV with satellite channels, seating area and private bathroom with a hairdryer and free toiletries. 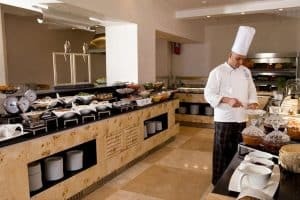 Breakfast is buffet style and the restaurant offers both Israel and international dishes. Ramada also has a free fitness centre on site, and the spa offers a wide variety of massages and facilities. The hotel also features a sun terrace, kid’s club and conference rooms. Tel Aviv is 20 minutes’ drive away. 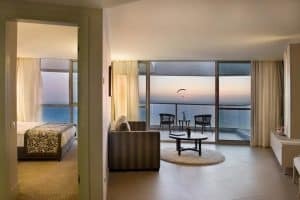 The hotel is well connected by Highway 2 and is just 15 minutes’ drive from Caesarea Golf Club. 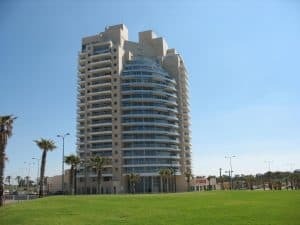 This property is also rated for the best value in Netanya! Guests are getting more for their money when compared to other properties in this city.